When we, as a people, were wandering in the dessert oops…. I mean desert, Hashem sustained and nurtured us with manna. While nobody has a picture of what it looked like (well it came from the heavens and landed on earth so it stands to reason it must have been kind of, you know, squashed) it’s redeeming quality was that it could taste like anything you could envisage. Just imagine, a food that taste like whatever you want, whenever you want. Talk about paradise. I, of course, would make my manna taste like the best food on the planet (next to chocolate of course), potato chips. Everyone one likes potato chips. Unless of course, you’re allergic to potatoes or salt or oil or life. Up until recently we’ve had to be content with limiting ourselves to munching the regular or no salt variety on Pesach. No more, in addition to the perennial chips, shoestring and there are now kosher for Pesach chips by mainstream chip manufacturer Lay’s, Manischewitz Dark Chocolate Coated chips, potato straws, Terra Real Vegetable Chips and No Salt Added Sweet Potato chips and seriously, if you’ve got all these chips to choose from can dips be far behind? 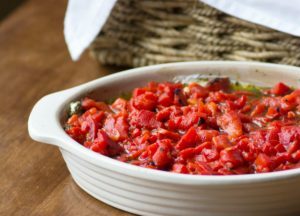 The following recipes were created with the potato chip fanatic in mind but are fantastic if you want to use them for a vegetable dip or as a sauce for fish. So, you’ll just have trust me. 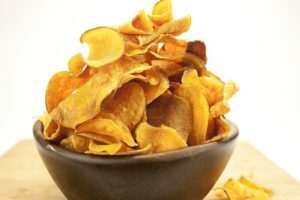 Even if the combination of some of the ingredients seem a little “weird” just close your eyes, take a taste and you’ll find yourself in pesach potato chip heaven. Or at least somewhere close by. Place the oil in a skillet. Heat over medium heat until hot. Add the red pepper and garlic; cook, uncovered, 20 to 30 minutes, stirring occasionally. Set aside, and cool slightly. Place pepper mixture in a blender or food processor; add chopped basil, vinegar, salt and pepper. Process until smooth, stopping once to scrape down sides. Makes approx. 2 cups. Combine the beaten eggs, sugar, and vinegar in a small sauce pan. Cook over a low heat, stirring constantly until the mixture thickens. Add the butter stir well, add the cream cheese and stir well. Keep stirring until the mixture is smooth. Add the horseradish, onion, celery and peppers. Season to taste. Pour into serving bowl, cover and refrigerate. Cool 3 to 4 hours before serving. Serves 6 to 8. Thanks! spell check strikes again.